I have updated the gallery! 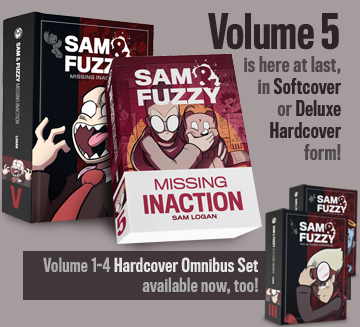 There is a metric ton of new stuff in there, both from myself and from the Sam and Fuzzy readers. So check it out. It's a new year, and several cartoonists have recently posted their top ten (or twenty) favourite CDs of the year. This is something I would really like to do myself, but because I am rambling and defensive, I couldn't do it without writing a ten page editorial discussing each album's merits. So, my list is on hold until I have time for that. You should probably hope that I never do. 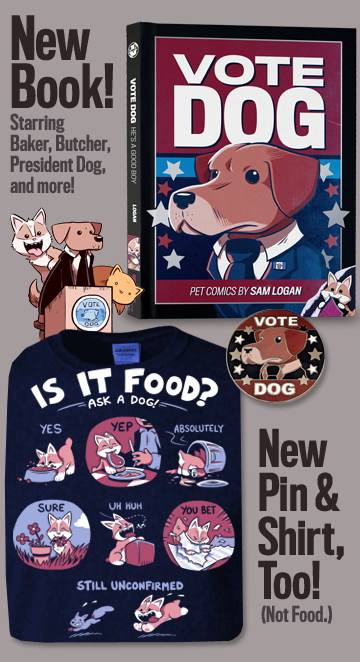 Believe it or not, today's strip launches a series that will be running all of next week. I don't know what got into me. I've never really used this space to wax philosophical about my personal life, so I probably shouldn't start now. But I have to say, 2003 was on the whole a pretty darn good year for me, and if that was in any way a result of something I actively did, it would probably be a good idea for me to figure out what exactly that was and then try to do it again. Or perhaps write a book about it and sell it to other people. For me, 2003 will be remembered as the year that this website really took off. Thank you to everyone who has helped make this website something I can keep doing! You guys make me feel like I'm really cool -- a delusion that required no small effort on your part to encourage. I opened my inbox the other day to find a link to a comic that I thought was pretty neat. Housd is definitely worth taking a look at, especially if you are stuck at home or work this new years and need some extra entertaining. SAM: Uh, what's with the boxing gloves, Fuzzy? FUZZY: It's boxing day, stupid. SAM: Yeah, but it's not that kind of boxing. See, the joke is that Sam got hurt and stuff. And wasn't that every bit as funny as it would have been if I had drawn it? Just think of how much time I would save if I presented all my strips in this manner. HAHAHA.